Have you ever had an ethnic live band meet you at the airport? On a background of an artful sculpture of gigantic carnival masks and feathers? 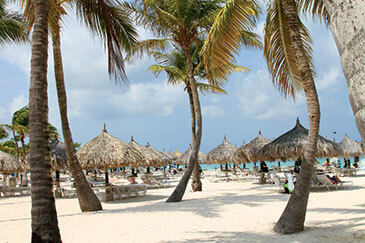 It wasn’t that Aruba meets press like that—I checked: they have it every day for every tourist. Hearing the sort of music I don’t know even how to name—except it rang “emerald waves and snowy bleached sand” in my head, my mind began unwinding right with the first notes. We all have variety of definitions of “hard work,” some laughable, and I have noticed those closest to the true essence of the phrase would never use the term. When I caught myself trying to sleep while dragging my suitcase on a long walk through the airport after a couple of sleepless working nights, I knew I was stretching even my definition. 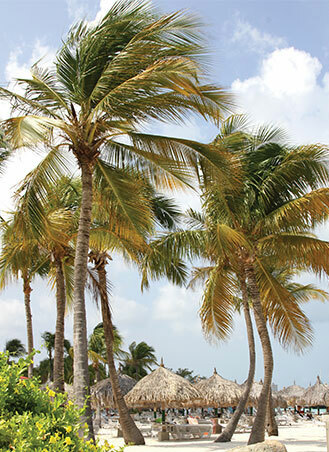 What was even worse, I faced another couple of them before I could even look in the eyes of this beauty Aruba: the magazine was about to go on newsstands; we were submitting two issues, the price for rapid growth had to be collected by the publishing business. I had caught reviving hours of sleep on the plane as soon as my laptop’s power drained and was ready to let the pleasure of music drill my brain with its beach sounds, exciting my anticipation of endless delights. 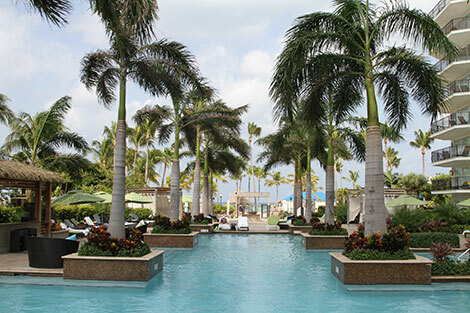 Aruba Marriott met with hints of eclectic delights mixed into a hard-core-tech-advanced hotel amenity, audaciously grabbing the best Aruban beach and boasting the only two swimming pool facilities on the island: a lagoon style chain of lakes around a waterfall for families and an elegant splendor with draped cabanas for singles. 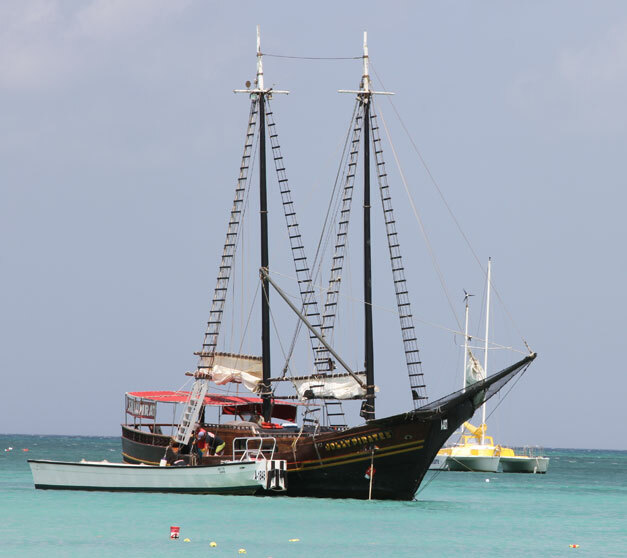 Running into the green warmth of heavenly waves shockingly threw me straight into the 17th Century: pirate ships reminiscent of Henry Morgan and Bluebeard decorated the placid waters along the coast, sailing to and from Marriott’s beach for tourist amusement. Run back to work turned torturous: the violently violet sunset, cut by sailing ships’ masts, torches around tablecloths of restaurants jumping out to the beach after the sun for their share of plunder and a masquerade show with dinner seen before in my schedule—all I had to slight for polishing the October issue in my room. Falling into sleep with first birds’ loud arias, I was awakened soon by energetic dance music with splashes and screams of excitement: a black beauty with body made of steel was dancing at the pool with an army of more ordinary looking people in the water trying to emulate those stunts. Wanting to scream by myself as my legs threatened to produce dance moves, as Colin Firth put it in his Oscar acceptance speech, joyous as they may be, it would have been extremely problematic if they would have made it to my legs before I got off the balcony. I had to force myself to shut the windows, blockade drapes and dive into the October issue. After all the excitement of the day and evening for normal people was gone, I found a dream office for myself: the pool bar, empty at night, surrounded by fluorescent lights underwater and beneath bridge and waterfall, had electric sockets and WIFI, so I nested there right after trying the Simply Fish restaurant’s best ever sea bass and my waiter’s favorite coconut cake—sort of warm cheesecake in the crust of chocolate, topped with ice cream—ummmmm, very unhealthy! This night I had a luxury of 3.5 hours sleep before finally obliging my schedule and going to an event: a jeep tour. By that time I missed, besides the carnival dinner, yoga on paddleboard and beach tennis—a combination of tennis and beach volleyball. On the third morning, I finally made it to La Vista breakfast parlor with an extreme ocean view, the restaurant made up of curved windows facing the ocean and round terrace for outdoor seating, just in case it’s not enough. The choice of food or exotics in its décor—I have nothing to report about as there is nothing wanted. Probably more berries wouldn’t hurt, that’s all. But again, I am an acclaimed blueberry addict. 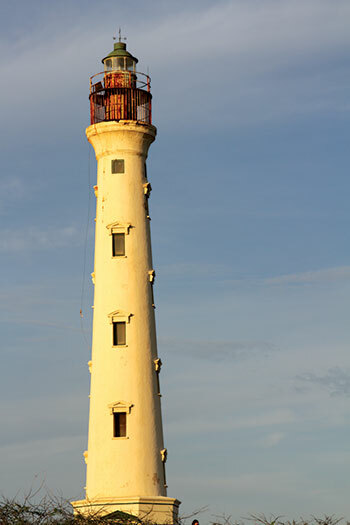 The truth is Aruba is a tiny desert island with few historic monuments to a native culture; one or two tours make it to all the tourist attractions. 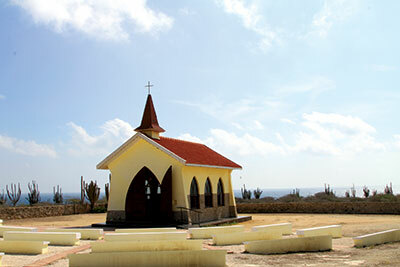 A lighthouse named “California,” after a shipwreck, is followed by a tiny church, Alto Vista Chapel, built in 1750. The building is quite unhappily situated in the middle of a desert and forest of gigantic cactuses where the midday heat burns every notion of life. But the church is as cool inside as an air-conditioned LA skyscraper, even though the door, which makes an entire wall, and windows are wide open to the heat and heated strangers. A few local families inside reflected the meltdown of nationalities possible only in a place with geographical luck of being in the middle of sea roads—Latino-Scandinavian, Cuban-Korean, African-Chinese, you name it, families made me wonder what a talented youth such a genetic combination bears capacity of producing. 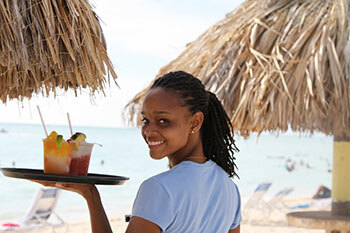 And because of that blood mixture, one almost never can figure a native nationality of an Aruban. The fun drivers do their best to bring tourists on an Aruban rollercoaster: they dragged jeeps through the piles of rocks on the severe Northern beaches, throwing passengers from side to side like potatoes. If not for seatbelts, their load would have found themselves in a bush of cactuses. For those who have seen the world the rough pleasures of rugged terrain were a piece of velvet cake. Meanwhile I had to disobey my belt to keep shooting with a fair prospect of befriending cactuses and trashing equipment. 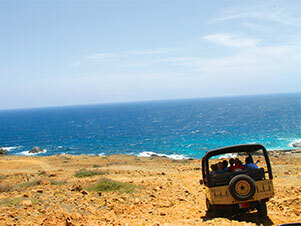 Despite the holes in its history, Aruba still has some ruins to boast. The 19th century gold mine ruins look like a castle on a coast so rocky that it would not have been approached for a kingdom anyway. Our dark skinned fun driver of an unrecognizable nationality and with a Russian name Vladimir told us that the mine even had mock cannons intended to scare off potential pirates passing by the island. 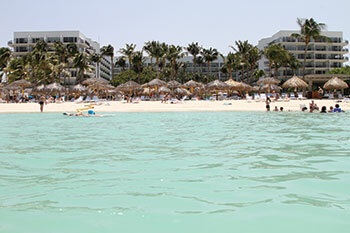 Aruba bears latent gold dust even today, but the cost of processing was, and remains, too high to be profitable, so mining stopped during World War I. All the gold went to the Netherlands, which administers the island as part of its kingdom. Indeed, Arubans are Dutch citizens. Abundantly supplied by snacks, drinks and jokes, we moved to the next destination—sort of a sad funny one. The island’s west facing beaches are milder than ponds. But around the north tip high coral ridges rise up with crashing white waves. 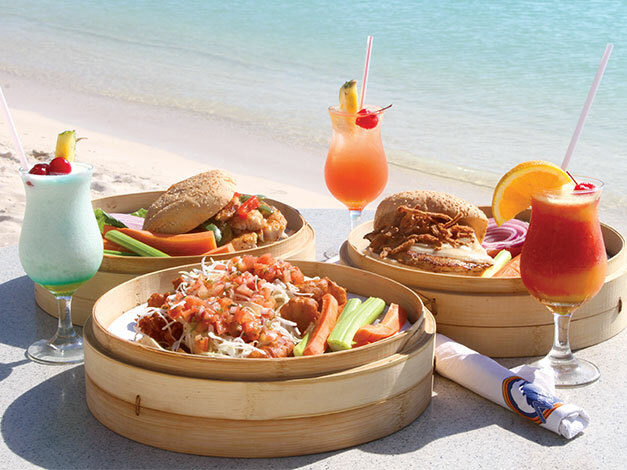 There are no rivers or water on the island, consisting of red coral and sandstone, except for the hotel beach by the Marriott and a few other places that indulge in sand softer than baby powder. 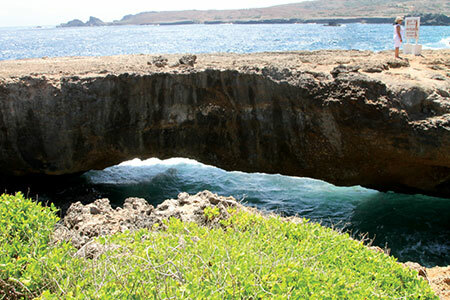 Aruba’s east coast once had the longest natural bridge in the Caribbean, formed over millions of years so an arch stretched from one giant coral outcrop to the next and the ocean washing through wearing a channel beneath. A 2007 storm has weakened and destroyed it until it suffered a broken back. So by now the bridge had crumbled into the sea, confining tourists to adore only the ruins and lament for the island’s misfortune. Luckily, another bridge exists nearby, the seventh longest in the Caribbean (I heard), and people walked across, over and around reconstructing in their minds how big his brother might have been. We rollercoasted downward to the sea after rising on the highest points of the low island, the Jeep lurched to the right while quad bikes tried to tractor past. The ocean swimming hole, or a natural pool as Arubans call it, at the end of the ride made every shock worthwhile. A ring of coral breaks boisterous waves, creating a tranquil blue 20-foot pond of flaccid clear fish-infused waters. The driver handed us snorkeling gear and we dove into schools of blue angel fish scattered into the light, which shined on strands of kelp fronds. The next evening, after tennis and two photo shoots, was booked for “sailing to sunset.” On a charming wooden pier my curiosity was awakened by a scene from Pretty Woman in play. Remember the classic phrase by a respectable lady to her respectable husband at the luxurious hotel’s elevator taken by Richard Gere and the dissolute character played by Julia Roberts: “Close your mouth, dear”? Here, the pier’s bar happened to be occupied by a small party celebrating the birthday of a character seemingly of the same nature, named Diana, as she kept informing the world. The pier, and, inevitably, the bar, was approached by a small crowd of passengers embarking on the ship. The crowd happened to be led, what a coincidence, by a very serious couple just like the one in the movie scene. The cultural clinch hung in the air. The length of Diana’s something, let’s call it a skirt, on her corpulent form, combined with her attempts to kiss every sailor on the pier soon produced that brilliantly shot scene with the only alteration that the lady needed a jaw lift too before she started directing her gentleman. 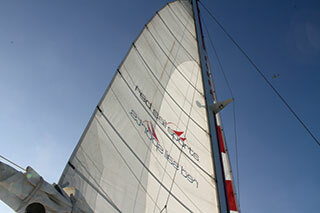 A white sleek catamaran with diving-into-the-sky linen sails easily swallowed a party of 20, gulped the wind and our souls and gaily ran along the coast on eight knots with its dancing-eating- drinking load. Another Aruban of unrecognizable inheritance and Russian name, Captain Dmitry, despite the general careless spirit, took the trouble of sharing with me a historical perspective: Aruba indeed had no native population and was started in the 17th century with sea trade and as a Dutch military base, being well situated as a cargo port for commodities between continents (an army of Jack Sparrows should have been attached to it as flies to cows, I suppose), later expanding into an oil refinery and tourism, retaining only the latter by now. He interrupted his exertion with occasional dances with three to five ladies at one time, which I laughingly found extremely intimidating to his fair partners, considering his class in it. The crew elegantly anchored their white beauty at night, waking the sleepy by then pier with the “gooood girl… I know you wan’ it…”and captain dancing with every passenger before partying. Sea ball, in short. I still made it to the Playa Linda in Noord right in time for dinner at Scala (try the filet mignon) when a light show with music from The Lion King went up in the square by the shops. Discotheque in the open bar next to the fountain was clearly shooting for a ransom from the show’s crowd. Imagine having a treatment at Marriott’s Mandara Spa being a job? The only disappointment of that would be not having girlfriends chirping around about shoes. Almost two hours in the mysterious world of herbal oils, having all my scarce meat worked on, and finally feeling just as the one—a loaf, a clean sheet of paper free of thoughts, past or present. Exactly what you need from a vacation, huh?